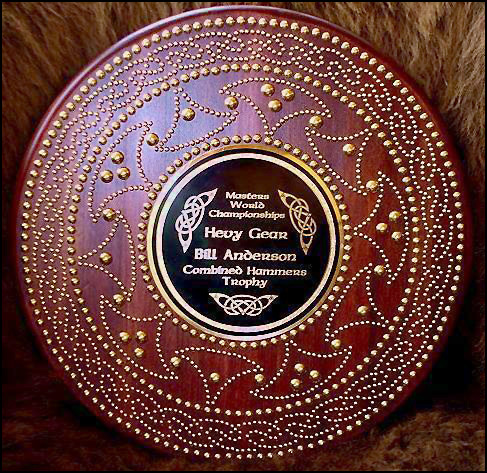 Celtic targe trophy design for The Scottish Master Athletics. And yes! That fella holding them had to hammer all those little brass nails in by hand. But sure turned out nice... good job Bill!! ;-) "The hammers trophy is named for Bill Anderson, perhaps the greatest hammer thrower of all time. The distances trophy is named for John Ross whose contribution to the masters game is immense. 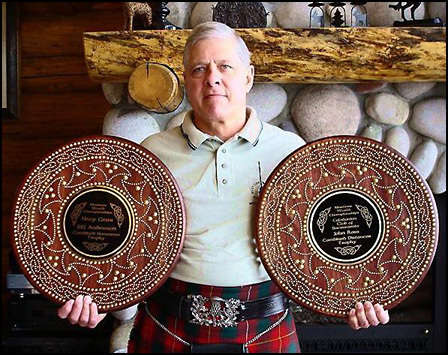 The SAAA stones trophy is named for a masters athlete who will be named at the Masters World Championships in Inverness, Scotland, this summer."